Hello Bugaboo Donkey! Where were you 9 years ago when my little tiny peeps were born? Confession time. I have a thing for strollers. Kind of like the way I have a thing for clothes and shoes. When the minnies were born, I didn't need one stroller. I needed multiple strollers for multiple occasions. The Emmaljunga double pram for walks on the cobblestone streets of Oaxaca, Mexico. The tires were real inflated tires! This sturdy stroller stands up to the roughest terrain and looks good in the process. Yes, it's big, but it's a pram. The girls took many, many naps in this stroller. I also had single stroller from Prenatal, a store from Spain, for quick trips with one baby in the stroller and the other in a baby carrier or with the nanny. So many of my other mommy friends who have older children out of strollers seem to feel the same way about newer strollers. They've certainly evolved in 9 years. Besides clothing, do you ever find yourself obsessing over something that is a must have? Some people love kitchen gadgets, other love decorating items, but I'm partial to cool strollers! Yes! I have a thing for strollers too! I had to have several different types. 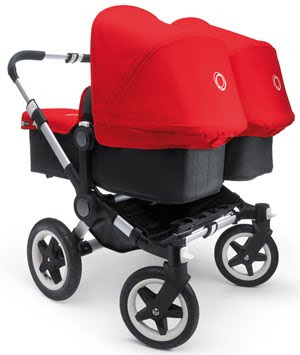 That bugaboo almost makes me want twins (almost!). You don't even want to know how many strollers I own! I think the last count was six - three doubles and three singles (since we had just one baby the first time, and then our twin set made their debut). They each server their own purpose and all have been used in the last year! I have a little thing for strollers too-- twin strollers especially since my babies are only 13 months apart! I also have a bit of a thing for lotions and potions. I could spend hours and hours in the drugstores and department stores smelling and testing the latest lotions, tonics etc for skincare. Love them! The best option for parents who have the twins baby..